The major miners will continue to focus on their low cost, low risk operations which made them so successful in the first place. I am closely following the highest quality juniors with attractive economic profiles in Nevada which the majors may find more attractive than some of the assets they are selling in Australia, Africa and/or South America. Look for increased M&A activity as the majors refocus their investments on low cost junior miners in Nevada, the best mining jurisdiction in the World. Marginal players in risky jurisdictions will struggle and lose market share to cash-rich juniors and mid-tiers in secure locations. In late June, I wrote about a historic opportunity ( http://www.gold-eagle.com/article/ground-floor-opportunity-next-commodity-super-cycle ) to buy the miners at possibly once in a generation multi-decade lows. I wrote, "It is during these difficult times in the resource sector when the greatest opportunities are discovered. Remember American Barrick Resources started off as a 16,000 ounce producer in the 80′s down market in gold and grew to be Barrick Gold Corp, the largest gold producer in the world." It was their discovery at Goldstrike in Nevada which made them grow exponentially. I expect investors will continue to hear good news coming out of Nevada’s low cost mines and increased merger and acquisition activity with high quality juniors. 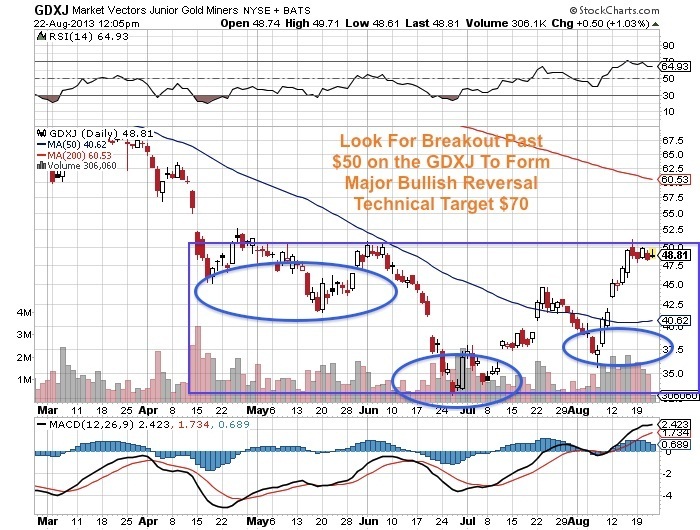 For weeks, I have been focused on some of the junior players on the verge of a breakout as I see potential long term bullish base reversals forming. 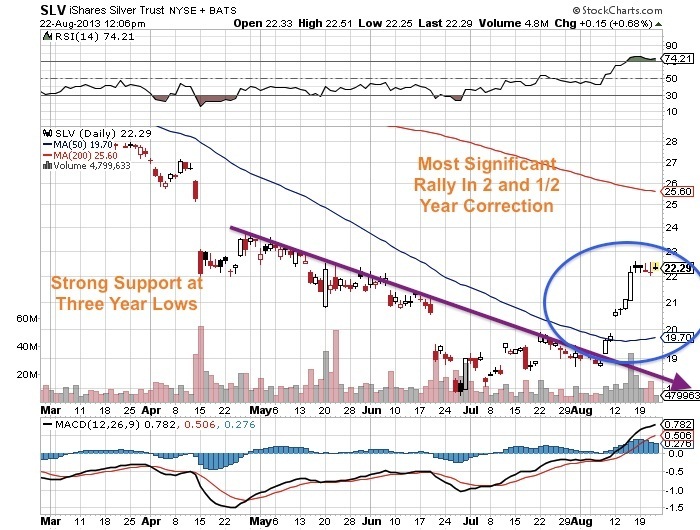 Silver (SLV) is making its most impressive rebound since the May 2011 top. Some of the junior miners (GDXJ) in Nevada are outperforming and should continue on the next upturn. Market share will be gained for juniors who have a strong treasury and have lower capital intensive profiles. There are some juniors who have outperformed the majors by a wide margin in 2013 and should continue to do so on the next upturn. Some of the fundamental characteristics of the juniors that have been outperforming and breaking out have been high grade discoveries and lower cost production scenarios. Research of the management teams is critical in this business. Only management teams which have a significant amount of the shares in their own hands and have proven track records should be considered. If the mine is near production, one must ask if the team has engineers that have gotten mines into production in the past. 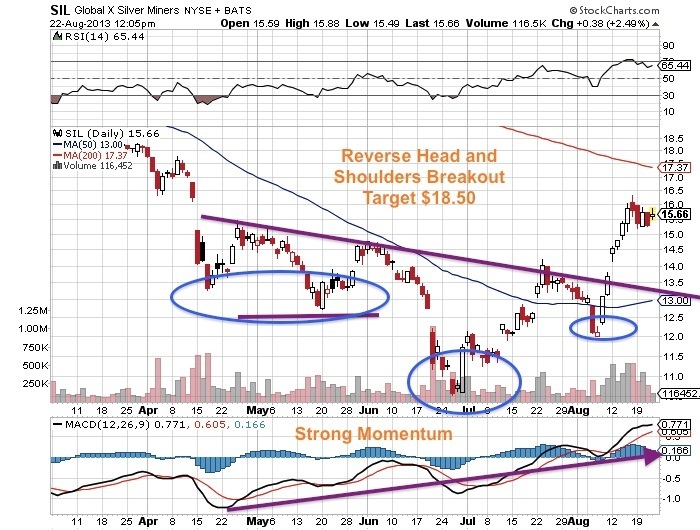 The junior gold miners and the silver miners (SIL) are beginning to outperform versus the overall equity market which is in correction mode. Investors should stick to the gold mining ETF's (GDX), unless they are willing to do a lot of due diligence which includes researching the share structure, financials, technical reports and management. However, if you do your homework in the junior space you can see some of the really exceptional situations and possibly outpace the benchmarks. This recent junior mining meltdown has given astute followers of the space a clear advantage as they can observe the high quality junior mining situations with the shareholder base which outperforms in both good and bad markets. During a correction one can easily observe which companies have strong financial support and can advance even during volatile economic weather. One should stick to companies with only strong cash positions and major shareholders such as reputable institutions or major mining companies. The junior miners with quality assets in stable jurisdictions, great balance sheets and tight share structures should outperform in the coming upswing. Disclosure: Author does not own any securities mentioned.